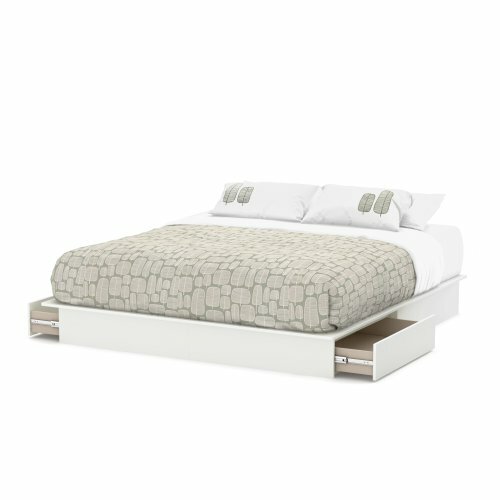 This Step One King Platform Bed with Drawers in a Pure White finish has a timeless look and blends easily in any décor. Provides storage with 2 large drawers, 1 on each side, equipped with ball-bearing full-extension drawer slides. Economic choice since it does not require a box spring. Weight capacity is 500 lbs. Can be attached to the headboard (3107290) for a complete kit. Also available in Chocolate or Pure Black finish. The interior drawer dimensions are 32-1/4-inch wide by 19-1/4-inch front to back. Measures 76-inch wide by 79-3/4-inch long by 10-1/4-inch high. Delivered in 2 boxes: BOX#1: 47-3/4 in. by 21 in. by 6-1/2 in., 107 lbs. ; BOX#2: 46 in. by 21-1/2 in. by 5-3/4 in., 100 lbs. The top surface of the platform bed is laminated. Mattress and accessories not included. New and improved drawer bottom made with wood fibers. Manufactured from certified Environmentally Preferred laminated particle panels. Complete assembly required by 2 adults. Approximate assembly time: 1:45. Tools are not included. 5-year limited warranty. Made in Canada.